When many people think of a Greyhound, racing first comes to mind. 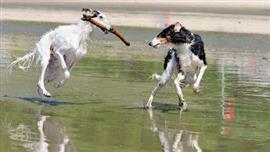 The breed is in fact one of the fastest land animals reaching a top speed of around 40mph. It is no surprise that names related to quickness and acceleration rank highly for the Greyhound. Many owners choose simple speed-related words like Flash, Lightning, or Turbo. Others borrow names from fast people, animals, and even automobiles. Olympic sprinters provide an excellent source of speedy names. Bolt (Usain Bolt), Tyson (Tyson Gay), and Carl (Carl Lewis) are a few names derived from male sprinters. Florence (Florence Griffith-Joyner), Marion (Marion Jones), and Evelyn (Evelyn Ashford) are names from among the fastest females in the 100 meter. The Cheetah is the swiftest land animal and also a lender of Greyhound names such as Chester (the Cheetos mascot) and Duma (from the book ‘How it Was with Dooms’). Name ideas coming from super cars include Enzo, Veyron, and Mclaren. Other Interesting names can come from a variety of places including famous bandits and marauders. Many outlaws that once etched their name in history are now popular dog tag brandings. Cassidy, Sundance, Billy, and Jesse are favorites. Some of our pages will contain a subcategory. A subcategory is a slightly more specific grouping than the main topic of the page. For a subcategory, we will include a separated table of names and corresponding descriptions. An example of a subcategory of Red Dog Names would be 'Dog Names Inspired by Red Wines'. If you have any subcategory ideas for the Greyhound Names page, we would love to hear them. Use the form below to submit your ideas.